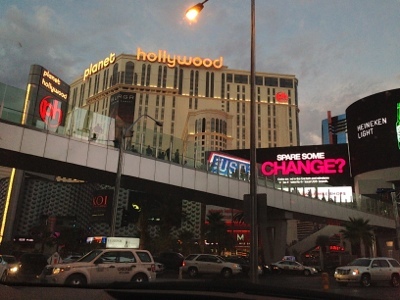 Continuing our summer 2013 Las Vegas trip... um, yeahhhh, this post is WAY overdue. Our good friends, J and J, were also in the Vegas for a couple days. They stayed at the cool Planet Hollywood Resort and Casino, which is where I picked our dinner meet to be -- Gordon Ramsay's BurGR. 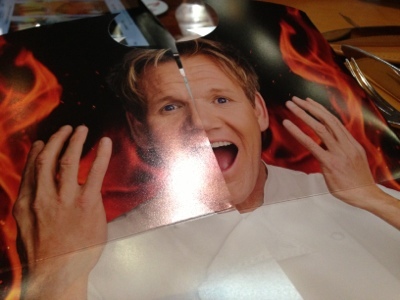 I love Gordon Ramsay, mainly because Masterchef is one of my favorite food competition shows, next to Top Chef. He is passionate about food, outspoken, can be perceived as mean, but I enjoy watching him. This restaurant appeared in one of the challenges this season on MasterChef. 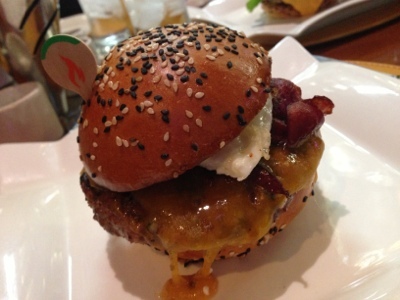 Yum, who doesn't love a good burger -- so M, my hubs, and I wanted to check it out. We met J and J at the YOLO bar (haha) for a drink while we waited for our table. 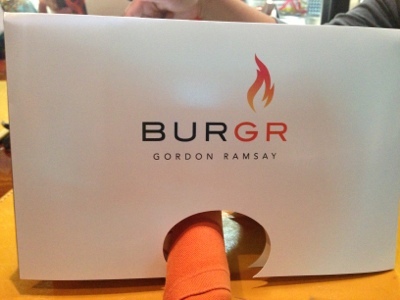 They got a text from the BurGR hostesses when our table was ready. 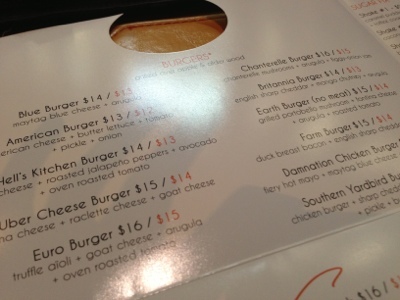 Above is a list of the burgers offered at BurGR. The prices in orange are for those who have a Harrahs Total Rewards card. You can view their complete menu here. I used mine for our party so we got the discounted prices! Yeah! 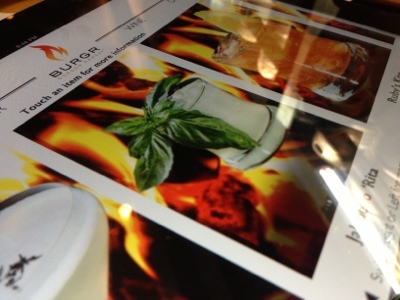 Our server brought us a fancy iPad for browsing the cocktail menu. 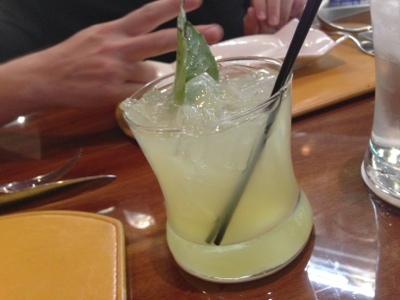 M ordered the Jalapeño 'Rita ($12.00) because not only does he love a good margarita on the rocks, he loves spicy food. The Jalapeno 'Rita tasted exactly like a classic margarita, but with a hint of the jalapeño pepper to hit the tongue at the end. We started off with two appetizers to share. 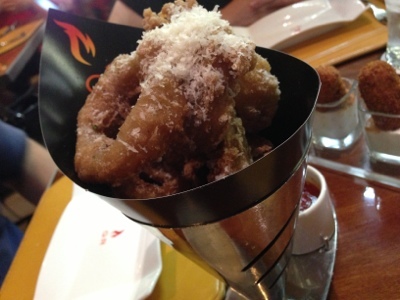 The Beer Battered Maui Onion Rings ($8.00) were thick, crunchy and sweet. They were served with a chipotle ketchup and a cheddar ranch dip. Mmm, cheese. 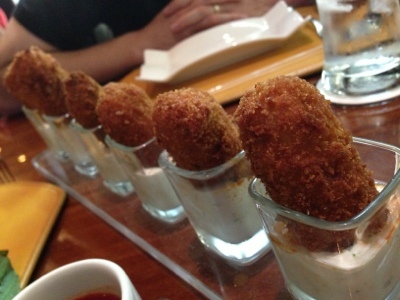 The Jalapeño Poppers ($11.00) were served in these super cute shot glasses with the same creamy cheddar ranch dip. Out of the six they served us, our server told us that one of them was a "fiery" surprise. We ate them one at a time -- waiting for our mouths to burst into flame, but after the first five, nope. Our server watched as M decided to take the last one; which, of course, we all thought was the spiciest one... but, NADA. We all had a good laugh because whoever ate the "one", ate it like it was nothing. J ordered her simple, but classic American Burger ($12.00) -- with their signature bun, american cheese, crisp butter lettuce, pickles, onions and tomatoes. M's theme for the night was definitely spicy between the jalapeño margarita and the poppers. 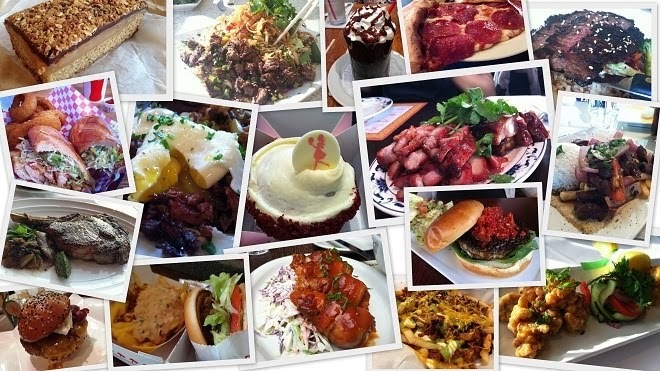 He ordered the Damnation Chicken Burger ($13.00) as his 'no beef' alternative. It had a fiery hot mayo, Maytag blue cheese and a carrot + celery slaw -- definitely a play on a buffalo wing, my hubby's favorite food in the entire world. 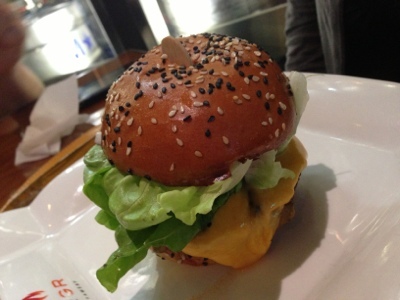 My Farm Burger ($14.00). What got my attention... duck breast bacon, English sharp cheddar and a fried egg. It was delicious, however... it was rich, on rich, on RICH. Did I mention that this was very rich? There was nothing to cut through all the savoriness -- like cole slaw, pickled veggies, or even tomato slices. 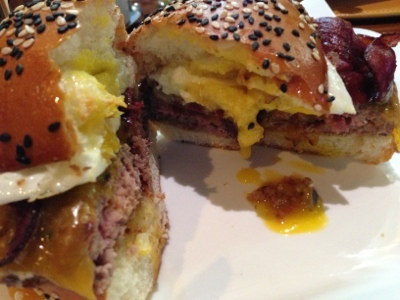 Still, it was really flavorful from the seasoned beef patty and rich egg. 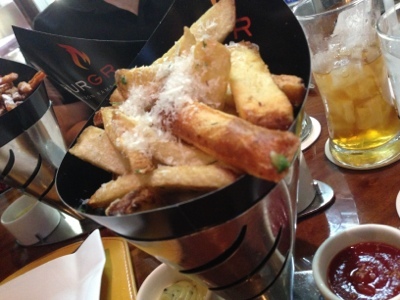 Of course, we had to have their truffle parmesan fries ($10.00) served with chipotle ketchup and truffle aioli. Yum, these were good, but I liked the sweet potato fries ($8.00) better. 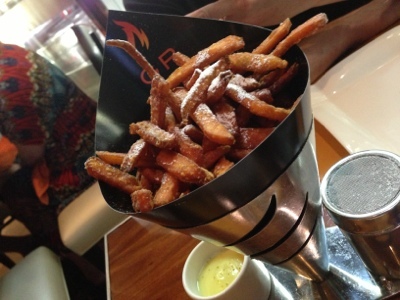 I loved the sweet potato fries with the dusted powdered sugar. 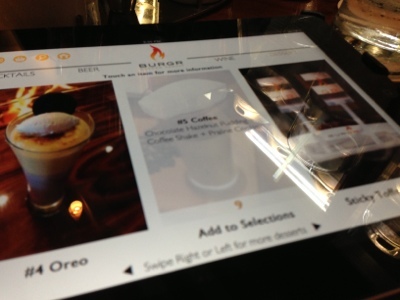 I thought it was interesting that only the cocktail menu and the dessert menu were on the iPad -- not the food menu? We were given the iPad again to review their dessert menu. 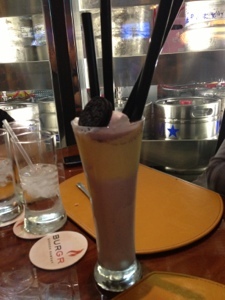 They have these pudding shakes that is their specialty dessert item. We decided to order the #4 Oreo ($8.00). Also, Gordon Ramsey is known for his sticky toffee pudding so I knew I had to try one of his Sticky Toffee Pudding Push Up Pops ($6.00 for two), . In one of this past season's MasterChef's episodes, he made the sticky toffee for a wedding reception. It looked so good. I tried to get all fancy and take a picture of both of the dessert images on the iPad and it just came out blurry. FAIL. I had asked our server to split the shake into four, she said, no (of course, it was a silly question)... but duh, since we were two couples, I should have asked them to split it into two -- I have seen it done via the pictures on Yelp. Ooopsies. 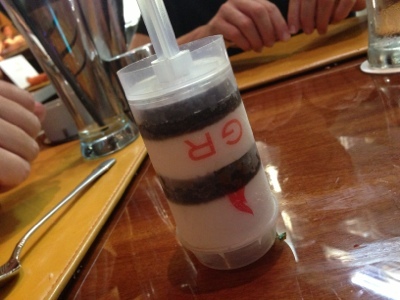 The Oreo pudding shake is basically a traditional Oreo milk shake at the bottom and then topped off with creme brulee pudding and an Oreo cookie. Personally, I thought it was just okay. The pudding was really thick and it was pretty impossible to sip it through the straw. There was nothing "brulee'd", just the custard, basically. Everyone was over it after a single taste, so I ended up with a few more sips/bites and I was pretty much done too. They usually prop up the two pops to make a nice presentation, but the server said she had to make it "to-go" because they ran out of the stands in the kitchen. Maybe it was a hint for us to leave, just kidding. Anyway, don't ask me why I did not even hold it the right way and take a picture of it. Here it is, upside down on the table, haha. Way to go, me. The sticky toffee pudding pop was delicious! Think of a thick, caramel-y, toffee cake with cold salted peanut ice cream (what? MMM). M and I loved it. I was happy that we went here. We will be back! 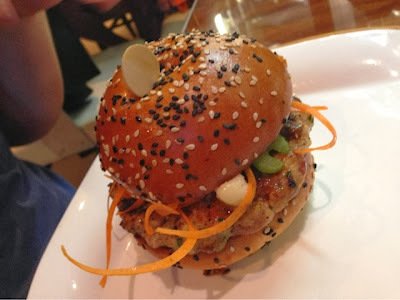 They also have these "Devil Dawgs" I would like to try and believe it or not, "Honey-Pig Bao Buns" (pork belly *drool*).